Girl Scouts are known for their service to the community and for selling delicious Girl Scout Cookies. Delicious as they may be, some of us are trying to steer clear of sugary treats. Where does that leave you? soldiers at Fort Campbell. Through the Gift of Caring program, you can help Girl Scouts reach their goals and provide scrumptious cookies to others. Additionally, because of your investment, girls can go to camp, prepare for college and learn how to budget and save money. Girls learn about teamwork and leadership as they offer a unique product to their communities. Do your part - empower your local Girl Scout and order your Girl Scout cookies today. 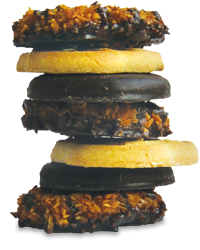 To find a Girl Scout troop selling cookies in your community, visit the Girl Scouts of Middle Tennessee website at www.gsmidtn.org. million girls and adults nationwide. Today, as when founded in 1912, GSUSA strives to build girls of courage, confidence and character, who make the world a better place. For information about Girl Scouts call (615) 383-0490 or visit www.gsmidtn.org.